The HMRC recently released its latest projections for the personal income tax collections for the 2010-2011 financial year. The department expects the national revenue figure to rise by approximately GBP 10 billion to a total of GBP 161 billion (approx. USD 243.1 billion). Nearly GBP 9 billion (approx. USD 13.6 billion) of the extra revenue will be accounted for by taxpayers earning over GBP 40 000 (approx. USD 60 408). 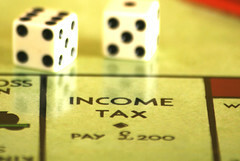 According to the HMRC, 400 000 more individuals will pay income taxes in the new financial year, though the significant majority of the revenue increase will be caused by upward drift between income levels to higher tax bands. The new projections show that revenues collected from the UK’s 26.4 million basic-rate taxpayers is expected to rise by GBP 1.2 billion (approx. USD 1.8 billion) to a total of GBP 68.1 billion (approx. USD 102.8). The additional increases projected by the HMRC will be accounted for by earners int eh 40 percent and 50 percent brackets. Over the 2010-2011 fiscal year, 3.1 million tax payers will fall in the 40 percent tax bracket, and pay a total of GBP 50.2 billion (approx. USD 75.8 billion). Only 282 000 individuals will qualify for the recently introduced 50 percent top-earners bracket, but will raise approximately GBP 42.5 billion (approx. USD 64.2 billion). Within the top bracket, an estimate 13 000 will be earning in excess of GBP 1 million (approx. USD 1.5million), and face an average tax liability of GBP 1 million (approx. USD 1.5million) each. The latest figures relay a greater sense of optimism from the UK Government. The HMRC previously projected that both tax revenues and the number of tax payers would fall in the 2010-2011 fiscal year. Chas Roy-Chowdhury, UK Association of Chartered Certified Accountants Head of Taxation, explained the turnaround, saying “Unemployment has not gone up as much as anticipated and there has been inward migration.” According to political analysts, the improved situation is likely to be maintained, as all political parties currently campaigning for the upcoming UK election have given general support to the current income taxation balance.